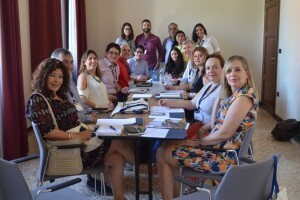 From June 22-25, 2016, the Auschwitz Institute for Peace and Reconciliation (AIPR) held the 2016 Raphael Lemkin Seminar for Genocide Prevention Alumni Meeting in Venice, Italy. Building on AIPR’s academic approach, which utilizes the power of place, the meeting was planned to coincide with the 500th anniversary of the establishment of the city’s Jewish Ghetto. The 2016 Alumni Meeting welcomed over 60 participants to the island of San Servolo for two days of programming. The event, titled “Human Rights Policy and the Early Prevention of Atrocity Crimes”, functioned as a space for alumni to share the work that they have done in prevention, as well as an opportunity for them to continue and build upon the concepts introduced to them at the Raphael Lemkin Seminar in Poland. 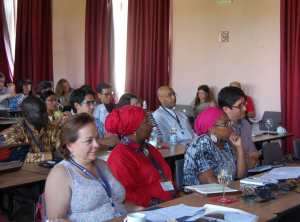 The first day of the Meeting focused on taking advantage of the situational learning and “power of place” offered by the seminar’s location in Venice. Following the event’s opening ceremonies, AIPR’s Director of Academic Programs, Dr. James Waller, presented modules on risk factors in upstream prevention and a series of case studies on the historical and contemporary role of forced concentrations in the persecution and destruction of civilian populations. Building on this theme, the day concluded with a tour through Venice’s Jewish Ghetto. The second day of the Alumni Meeting began with attendees breaking into regional groups, which worked as a forum for representatives to share updates, lessons learned, thematic priorities, and work plans for work on genocide and atrocity crimes prevention. This session reflected AIPR’s goal of supporting national and regional mechanisms for prevention. Following a discussion on “Emerging Networks and Programs” by Dr. Ashad Sentongo, Director of AIPR’s Africa Program, and alumni Fabián Oddone, Deputy Chief of Mission at the Embassy of Argentina in Bogota, Colombia, and David Schwake, Head of Division in the Early Warning and Scenario Planning Office of the German Foreign Office, the Regional Alumni Groups delivered presentations which covered the updates and plans for collaborative efforts in the future, as had been discussed in their regional groups. The meeting was concluded with two final modules focusing on the role of gender in the prevention of genocide and mass atrocities. The first, led by Dr. Waller, discussed gender-based violence as a risk factor in atrocity crimes. 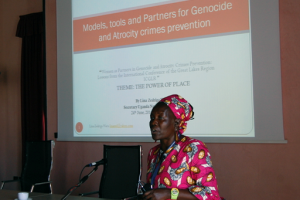 The second, presented by Lina Zedriga Waru Abuku, Secretary of the Ugandan National Committee for the Prevention and Punishment of the Crime of Genocide, War Crimes, Crimes Against Humanity and All Forms of Discrimination, considered the role of women as partners in prevention. The agenda, participant list, and collection of photos from the Alumni Meeting can be found here. For more information on the Raphael Lemkin Seminar series or the 2016 Lemkin Alumni Meeting, please contact the Program Director, Ms. Samantha Capicotto.